Derived from a limited edition piece called Nuage I (first unveiled at Design Miami / Basel in June 2009), the suspension fits the proportion of the volumes that welcome it : the sculptural atrium of London’s Louise T Blouin Foundation. 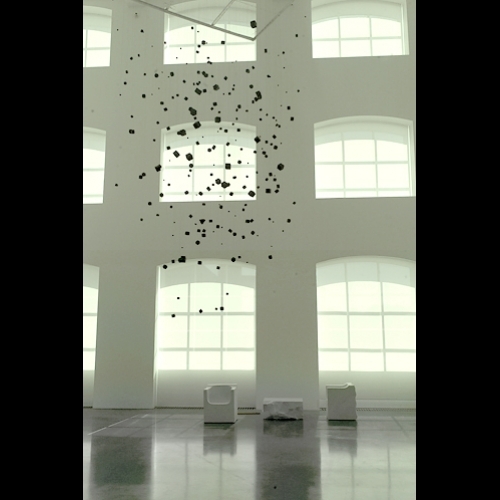 « Inhabiting the space, the cloud-like installation evolves into a suspended moment in time : poised, it seems to hold its breath before vibrating anew. Combining, speed of light with inertia, the accumulation of cubes resembles a static explosion. Set on the floor, the inverted mirror reflects its surroundings, recreating a sense of movement in close contact with spatial weightlessness.